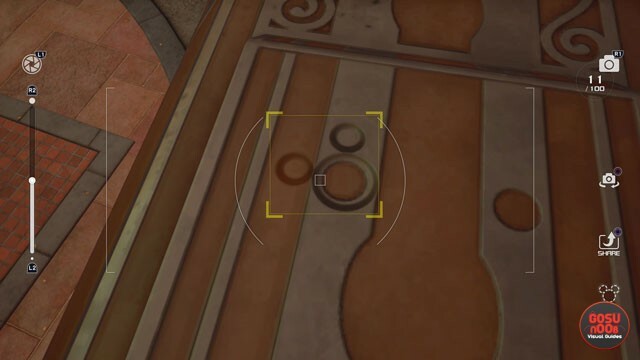 Lucky Emblems in Kingdom Hearts 3 Twilight Town are a hidden collectible you can find, in the shape of a Mickey head. The Twilight Town lucky emblem Mickey head locations are all over the map, just like the other maps. Some of them are extremely difficult to find. However, finding them is pretty fun, because they can be hidden in some pretty clever ways. Our Kingdom Hearts 3 Lucky Emblem Twilight Town Locations Map aims to help you on your journey by showing you where to find all the Mickey Heads in both Twilight Town and The Woods outside of the town. The first Lucky Emblem Mickey Head location in Twilight Town is really easy to find. The moment you arrive to the first fast travel point (The Neighborhood), look slightly to the left. You’ll notice a circular sign hanging above some benches. There’s an orange diamond shape in the wall to the left of the sign. The Mickey head is right below the orange diamond, just above the potted plant. For the second Lucky Emblem, climb onto one of the buildings next to the tram / cable car tracks (the wide, grey path). When the cable car comes around, jump onto the roof, and find the Mickey head there; it’s not hard to spot. The third emblem is also close by. If you look to the right from the fast travel point, you’ll see the strange tower full of jutting pipes, the one with the store. Run up the wall to the pointy roof. You’ll see three chimneys up there, and the Mickey Emblem is on top of one of them. As for the fourth Lucky Emblem, swing around the store with the acorn-bullet-whatever else (the one where Dewey is hanging out). Climb up the stairs and follow the path. Walk past the overpass on the right, and go left when you can. You’ll come across an open-air cinema. Wait for the movie to wrap up, and you’ll find the Mickey head on the screen when the projection stops. The Twilight Town Lucky Emblem five is pretty clever. From the fast travel point, head straight forward, and climb the building in front of you. From the far end of the roof, you can see a small cafe on top of the roof across the street. Jump to the rooftop above the cafe, and look down at the table. The plates form the shape of Mickey’s head. To find the first Lucky Mickey Head Emblem in The Woods area, look at the doors of the entrance to the sewers that you used to exit the town. The emblem is on the door on the right. The second Lucky Emblem in The Woods is also close by. Run up the wall to the left of the door that led you into the woods. You can easily spot the Mickey Head from that narrow platform. To find the eight Twilight Town Lucky Emblem, you’ll have to explore the woods. If you look at the mini-map in the upper right corner, you’ll notice a single curved line in the east. If you go there to explore, you’ll find a grassy mound, and an orange hidden Mickey Head right there for you to photograph. The ninth and final Lucky Emblem awaits at the ending of the woods. When you reach the gates of the mansion, look at the wall on the left. You’ll see the Mickey head between the bushy vines.